DENVER— The Center for Biological Diversity and the Pike and San Isabel National Forest signed a settlement agreement today that will help protect the only creek in the world inhabited by rare greenback cutthroat trout, Colorado’s state fish. The agreement prohibits motorcycles and off-road vehicles from trails along Bear Creek, just outside of Colorado Springs, and resolves a lawsuit filed by the Center in September. Greenback cutthroat trout have been listed as threatened under the Endangered Species Act since 1978. A DNA study earlier this year determined that Bear Creek hosted the last pure and wild population of the fish. For years, though, off-road vehicles have been severely eroding Bear Creek Canyon’s steep slopes. The runoff harms water quality and is filling in deep pools that the fish use to hide from predators and survive winters and droughts. 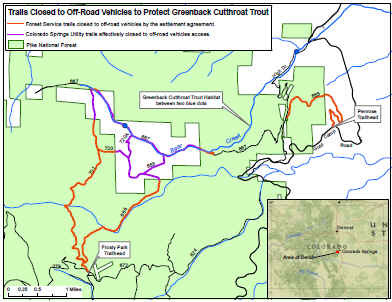 Under the terms of the agreement filed in federal court today in Denver, the Forest Service is required to prohibit off-road vehicles on nearly all of the five trails that run through the Bear Creek watershed. Before any part of those closed trails can be reopened, the Forest Service will have to consult, as required by the Endangered Species Act, with the U.S. Fish and Wildlife Service to ensure that trail use would not harm the threatened fish. The Forest Service also plans to complete a comprehensive assessment of the watershed that could result in additional changes to protect the fragile stream. While the settlement agreement does not include the Colorado Springs Utility, closure of the Forest Service trails in Bear Creek effectively closes all access by motorcycles to the Utility’s Jones Park land. Access by hikers, mountain bikers and horse riders is not affected by the agreement. The Center for Biological Diversity is a national, nonprofit conservation organization with more than 450,000 members and online activists dedicated to the protection of endangered species and wild places.